Need office furniture in Indianapolis? Workspace Solutions serves Indianapolis, Carmel, and Noblesville as well as Central and Northern Indiana with high quality business furniture for every space in your office. Workspace Solutions specializes in finding creative solutions to your office needs from furnishing a single office to expanding existing office space, We can make efficient use of both the space and budget . We carry quality, hardworking new and used office furniture for every space in your office including desks, office chairs, conference room furniture, reception furniture, collaboration furniture, lobby and waiting room furniture, and more. Our furniture looks great and wears well, all at a competitive price, with installation and delivery by our own crews. Whether you’re looking for a single chair or desk, or need to furnish an entire office, Workspace Solutions offers a large selection of new and quality used office furniture. Contact Gary McDermid today. Gary has been supplying the Indianapolis area for over 20 years with office furniture and office design solutions. Gary McDermid represents Workspace Solutions in the Indianapolis and Carmel areas. 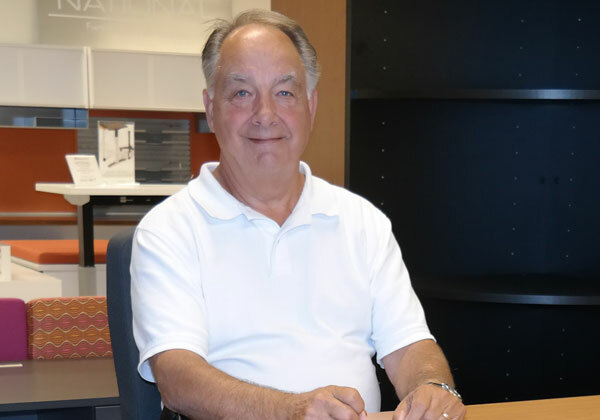 With over 35 years in the office furniture field, Gary can help you find the right solution for your space.